Dendritic cells (DCs) in lymphoid tissue comprise conventional DCs (cDCs) and plasmacytoid DCs (pDCs) that develop from common DC progenitors (CDPs). CDPs are Flt3+c-kitintM-CSFR+ and reside in bone marrow. In this study, we describe a two-step culture system that recapitulates DC development from c-kithiFlt3−/lo multipotent progenitors (MPPs) into CDPs and further into cDC and pDC subsets. MPPs and CDPs are amplified in vitro with Flt3 ligand, stem cell factor, hyper–IL-6, and insulin-like growth factor-1. The four-factor mixture readily induces self-renewal of MPPs and their progression into CDPs and has no self-renewal activity on CDPs. The amplified CDPs respond to all known DC poietins and generate all lymphoid tissue DCs in vivo and in vitro. 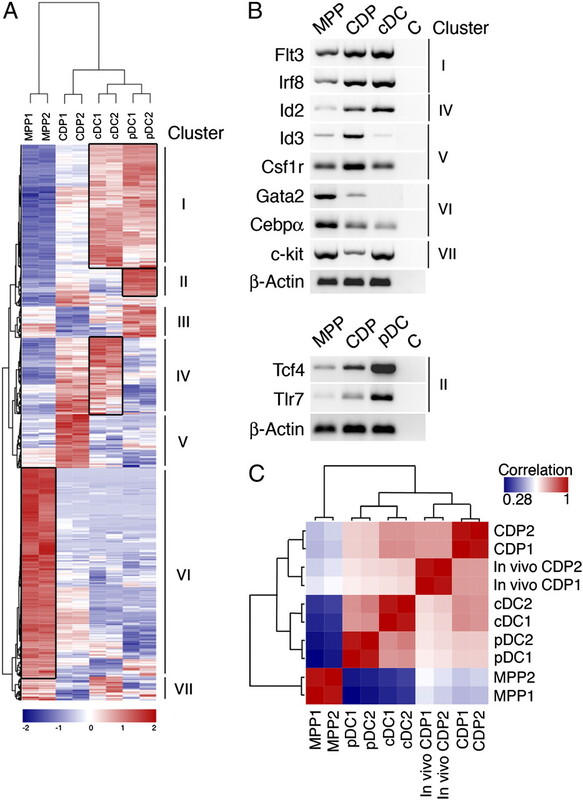 Additionally, in vitro CDPs recapitulate the cell surface marker and gene expression profile of in vivo CDPs and possess a DC-primed transcription profile. TGF-β1 impacts on CDPs and directs their differentiation toward cDCs. Genome-wide gene expression profiling of TGF-β1–induced genes identified instructive transcription factors for cDC subset specification, such as IFN regulatory factor-4 and RelB. TGF-β1 also induced the transcription factor inhibitor of differentiation/DNA binding 2 that suppresses pDC development. Thus, TGF-β1 directs CDP differentiation into cDCs by inducing both cDC instructive factors and pDC inhibitory factors. Dendritic cells (DCs) are professional APCs that are important in inducing adaptive immune responses and maintaining T cell tolerance (1–3). DCs are divided into several subsets according to their localization, phenotype, and function. The main DC subsets are conventional DCs (cDCs) and plasmacytoid DCs (pDCs) found in lymphoid organs and migratory tissue DCs that are spread throughout peripheral organs (2, 3). DC development shows remarkable plasticity, and DCs have been shown to develop from both lymphoid and myeloid compartments via Flt3-expressing progenitors (4–6). Recently, clonogenic DC progenitors were described: a Flt3+c-kit+CX3CR1+ macrophage/DC progenitor (MDP) (7, 8) and an Flt3+c-kitintM-CSFR+ common DC progenitor (CDP) (9, 10). 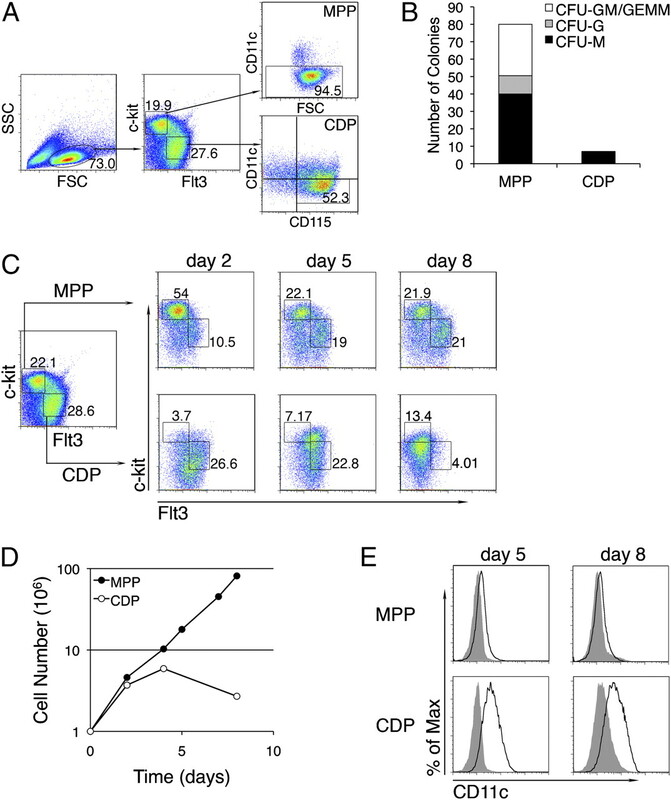 MDPs give rise to macrophages and DCs, whereas CDPs are DC-restricted and do not generate other cell types. Indeed, MDPs were shown to be more heterogeneous and to contain CDPs (8, 11, 12). Frequently, DCs are generated from bone marrow or cord blood-derived hematopoietic stem/progenitor cells or blood monocytes in vitro. The major cytokines used in culturing DCs are Flt3 ligand (Flt3L) and GM-CSF, and, more recently, M-CSF (13–17). Flt3L and M-CSF cultures give rise to cDC and pDC subsets, whereas GM-CSF induces the differentiation of CD11bhi DCs. According to the current view, Flt3L-generated DCs are considered as in vitro equivalents of steady state DCs, as found, for example, in spleen. Flt3L is the major cytokine for DC development in steady state in vivo; Flt3L is a potent inducer of both cDCs and pDCs in human and mouse (15, 18, 19). Accordingly, Flt3L-deficient mice have a severe reduction in DC numbers in several lymphoid organs (15, 20, 21). Interestingly, administration of M-CSF induces cDC and pDC generation in vivo (17), and M-csf–deficient (CSF-1op/op) mice have reduced numbers of splenic DCs (22), indicating the in vivo relevance of M-CSF in DC development. In contrast, GM-CSF induces differentiation of inflammatory DCs that have no steady-state counterpart in vivo. GM-CSF appears to be involved in MDP and CDP homeostasis in bone marrow as well as in nonlymphoid tissue dermal DC development (21). However, Gm-csf– and Gm-csfr–deficient mice have only a very mild reduction in DC numbers in lymphoid tissues where Flt3L is the more crucial factor (21, 23). TGF-β1 is a pleiotropic cytokine involved in a variety of biological processes, such as development, differentiation, apoptosis, and cell survival (24). TGF-β1 is crucial for development of Langerhans cells, the cutaneous contingent of migratory DC, both in vivo and in vitro (25–27). Yet, the influence of TGF-β1 on development of other DC subsets is so far unknown. The current understanding of DC development is mainly based on studies of genetically modified mice and knockout models that lack transcription factors (reviewed in Refs. 3, 28, and 29). STAT3 is a central transcription factor in Flt3 signaling, and deletion of STAT3 severely impairs DC development (30). PU.1, an Ets family transcription factor, is expressed highly in hematopoetic progenitors and DCs (31). Mice reconstituted with Pu.1-deficient hematopoietic cells have severe hematopoietic defects and lack cDCs (32, 33). Ikaros, a zinc finger transcriptional regulator, is required for the normal development of early hematopoietic progenitors (34). Ikaros deficiency leads to either the ablation of all DC subsets or the absence of specific DC subsets, which depends on the type of mutation introduced (35, 36). Other transcription factors have a more selected impact on DC subset specification. The development of cDCs is influenced by the IFN regulatory factors (IRFs) IRF-2, IRF-4, and IRF-8 (also known as ICSBP) (37), the helix-loop-helix (HLH) transcription factor inhibitor of differentiation/DNA binding 2 (Id2) (38), and the NF-κB/Rel family member RelB (39, 40), among others. pDC development depends on the basic HLH factor E2-2 (41, 42), the Ets-domain transcription factor Spi-B (43), and IRF-4 and IRF-8 (37). Although critically adding to our understanding of DC development, it is worthwhile to note that these studies so far concentrated on the phenotype in mature DCs. It is yet unclear at which stage and how these factors influence DC development. In this study, we investigated the early steps of DC development from multipotent progenitors (MPPs) and CDPs, and the impact of TGF-β1 on DC subset specification from CDPs. CDPs are very scarce cells in vivo; thus, we used an in vitro culture system to obtain high numbers of CDPs. We show consecutive differentiation of MPPs to CDPs and further to DC subtypes and provide functional and molecular analyses of this differentiation pathway. We also demonstrate that TGF-β1 accelerates DC differentiation and directs differentiation toward cDCs by inducing a cDC-affiliated transcription profile in CDPs. C57BL/6 mice, CD45.1 (B6.SJL-Ptprca Pepcb/BoyJ), GFP transgenic mice (44), and CX3CR1-GFP knockin mice (45) were maintained under specific pathogen-free conditions in the central animal facility of RWTH Aachen University Hospital, Aachen, Germany. All animal experiments were approved by local authorities in compliance with the German animal protection law. Bone marrow suspensions were prepared, and cells were cultured in RPMI 1640 medium supplemented with 10% FCS, 100 U/ml penicillin/streptomycin, 2 mM l-glutamine (all from Invitrogen Life Technologies, Carlsbad, CA), and 50 μM 2-ME (Sigma-Aldrich, St. Louis, MO) with 25 ng/ml Flt3L (PeproTech, London, U.K.), 30 U/ml stem cell factor (SCF; PeproTech), 5 ng/ml IL-6/soluble IL-6R fusion protein (hyper–IL-6, kindly provided by S. Rose-John, Kiel, Germany), and 40 ng/ml long-range insulin-like growth factor-1 (IGF-1; Sigma-Aldrich). After 3 d of culture, cells were subjected to Ficoll-Hypaque density gradient centrifugation (density, 1.077 g/ml). Cells were kept at 2 × 106 cells/ml and refreshed with medium and cytokines every second day. Progenitor cells were harvested on day 7 of culture. To induce DC differentiation, progenitor cells were washed and cultured further with 50 ng/ml Flt3L, 200 U/ml GM-CSF, or 20 ng/ml M-CSF (all from PeproTech) for 5–10 d.
B cells were generated in cocultures with OP9 cells. B cell medium was alpha-MEM supplemented with 10% FCS, 100 U/ml penicillin/streptomycin, 2 mM l-glutamine, and 100 μM 2-ME with 1% conditioned supernatant from IL-7–producing J558 cells and 5 ng/ml Flt3L (PeproTech). rTGF-β1 (R&D Systems, Minneapolis, MN) was used at 10 ng/ml concentration for short-term (≤24 h) and at 3 ng/ml concentration for long-term (>24 h) treatments. Abs directly conjugated to biotin, FITC, PE, PE-Cy5, PerCP-Cy5.5, PE-Cy7, allophycocyanin, or Pacific Blue specific for the following Ags were used: AA4.1/CD93/Ly68 (AA4.1), B220 (RA3-6B2), CD3ε (145-2C11), CD4 (GK1.5), CD8α (53-6.7), CD11b (M1/70), CD11c (N418 or HL3), CD19 (1D3), CD24 (M1/69), CD45.1 (A20), CD45.2 (104), CD115 (AFS98), CD117 (ACK2), CD127 (A7R34), CD135 (A2F10.1), Gr-1 (RB6-C5), MHC class II (MHC-II; M5/114.15.2), PDCA-1 (JF05-1C2.4.1), Sca-1 (D7), SiglecH (440c), and Ter119/Ly-76 (TER-119) (all from BD Biosciences, San Jose, CA; eBioscience, San Diego, CA; or Miltenyi Biotec, Bergisch Gladbach, Germany). Pacific Blue-labeled F4/80 (Cl:A3-1) Ab was from AbD Serotec (Düsseldorf, Germany). Purified CD49d (R1-2) and CD49f (GoH3) Abs were from BD Biosciences. Lineage-positive cells were stained with biotin-conjugated Lineage Cell Detection Cocktail (Miltenyi Biotec). Streptavidin-FITC, streptavidin-PE, and streptavidin-allophycocyanin were from Invitrogen or eBioscience. Streptavidin-PerCP-Cy5.5 was from BD Biosciences. Secondary goat anti-rat Ab conjugated to PE was from Invitrogen. Cells were treated with anti-FcR–blocking reagent (Miltenyi Biotec) and 3% mouse serum prestaining. Routinely, staining with the respective isotype was used as control. Apoptosis was measured with Annexin V-FITC apoptosis detection kit (BD Biosciences). Cells were analyzed by FACSCanto II (BD Biosciences) using FlowJo software (Tree Star, Ashland, OR). Amplified MPPs and CDPs were sorted as Flt3−/loc-kithiCD11c− cells and Flt3+c-kitintM-CSFR+CD11c−IL-7Rα− cells, respectively, at day 7 of culture. Cultures were deprived of cytokines for 1.5–2 h prestaining for flow cytometry. In vivo CDPs were sorted from bone marrow as lineage-negative Flt3+c-kitintM-CSFR+IL-7Rα− cells. Biotinylated Abs against B220, CD11b, Gr-1, CD11c, CD3ε, Ter119, and NK1.1 and streptavidin-FITC were used to stain lineage-positive cells. Cell sorting was performed with an FACSAria device (BD Biosciences). In vitro-amplified MPPs and CDPs were FACS sorted and plated in semisolid methylcellulose (MethoCult GF M3434, StemCell Technologies, Vancouver, British Columbia, Canada) containing insulin, transferrin, SCF, IL-3, IL-6, and erythropoietin (5000 cells/ml). Colonies were evaluated by microscopy at day 6, and colonies consisting of >40 cells were counted. Representative colonies were picked at day 8, and cytospins were stained with Diff/Quick (Dade Behring, Düdingen, Switzerland). Erythroid differentiation was assessed by neutral benzidine staining. For monitoring cell proliferation, cells were labeled with CFSE (Molecular Probes, Eugene, OR). Briefly, cells were washed and resuspended in PBS at 1 × 107 cells/ml. Labeling was performed with 3.5 μM CFSE for 10 min at 37°C and stopped by addition of culture medium. Cells were washed twice with medium and analyzed by flow cytometry 24, 48, and 72 h postlabeling. Cell numbers were determined with an electronic cell counter device (CASY1, Schärfe Systems, Reutlingen, Germany). MPPs and CDPs were obtained by FACS sorting from bone marrow cultures of C57BL/6 mice at day 7. A total of 1 × 106 CD45.2+ MPPs or CDPs was injected i.v. into CD45.1+ mice along with a radioprotective dose of 1 × 105 CD45.1+ bone marrow cells. Recipient mice were lethally irradiated (twice at 5.5 Gy in 3-h intervals). At 10 d and 28 d after cell transfer, recipient mice were sacrificed, and bone marrow and spleen were analyzed for donor-derived hematopoietic cells by flow cytometry. Three recipients per group were used. RNA was isolated using RNeasy Mini or Micro Kit with DNaseI digestion (Qiagen, Hilden, Germany) according to the manufacturer’s protocol. Reverse transcription reaction was performed with 1 μg RNA using a High Capacity cDNA RT Kit (Applied Biosystems, Foster City, CA). RT-PCR was performed with 50 ng cDNA (for primer sequences, see Supplemental Table III). RNA was isolated using RNeasy Mini or Micro Kit with DNaseI digestion (Qiagen) as above and subjected to microarray analysis as before (38, 46). Briefly, sample preparation was performed according to the Expression Analysis Technical Manual (Affymetrix, Santa Clara, CA). GeneChip One-cycle Target Labeling Kit (Affymetrix) and 1 μg total RNA were used for in vitro-generated MPP, CDP, cDC, and pDC samples. GeneChip 3`IVT Express Kit (Affymetrix) and 50 ng or 250 ng total RNA were used for in vivo CDPs and samples of TGF-β1 kinetics, respectively. Biotin-labeled cRNA was hybridized on Affymetrix Mouse Genome 430 2.0 Arrays (Affymetrix). GeneChip arrays were stained, washed, and scanned according to the manufacturer’s protocol. Gene expression levels were determined by GCRMA algorithm in R/Bioconductor (47). Principal component analysis (PCA) was done by prcomp in R package stats. Hierarchical clustering was performed using Pearson correlation coefficient and the average linkage method and represented by dendrogram and/or heatmap. Differential expression between two conditions was analyzed using Student t tests. The transcripts with a fold change >2 and p values <0.05 were considered as being differentially expressed. Raw p values were adjusted by Benjamini and Hochberg’s method (48). For TGF-β1 data sets, the differentially expressed transcripts were detected between any two time points. Fuzzy c-means algorithm in R/Bioconductor package Mfuzz (49) was applied to reveal the gene expression pattern in TGF-β1 kinetics data. Specifically, for each time point (0, 4, 8, 12, and 24 h), the gene expression values of the biological replicates were averaged. Then, the differentially expressed transcripts with averaged expression were clustered by Fuzzy c-means algorithm with parameter k = 6 and m = 2 (49). The algorithm was performed on 100 independent runs, and the one with highest silhouette values was selected (49, 50). The R/Bioconductor package GOstats (51) was used for Gene Ontology (GO) (52) enrichment analysis. Data sets were submitted to Gene Expression Omnibus database (http://www.ncbi.nlm.nih.gov/geo) under accession number GSE22432. Mouse bone marrow cells were cultured in the presence of Flt3L, SCF, hyper–IL-6, and IGF-1. The culture induced propagation of synchronously proliferating Flt3+ cells with typical multipotent hematopoietic stem/progenitor cell morphology and surface Ag repertoire (Supplemental Fig. 1A–D). When Flt3L, SCF, hyper–IL-6, and IGF-1 were added individually or in different combinations, the most pronounced response in proliferation was measured for cytokine cocktails containing Flt3L (Supplemental Fig. 1E). The amplified progenitors gave rise to all hematopoietic lineages in vivo, including all DC subsets, when transferred into lethally irradiated recipients, which demonstrates their multilineage potential (Supplemental Fig. 2). Progenitor cells showed spontaneous differentiation into CD11c+ DCs, which increased with culture time: at day 5, essentially no CD11c+ cells were measured, whereas at day 7, CD11c+ cells constituted ∼10% of the culture (Supplemental Table I and data not shown). Thus, the culture contained cells that are primed for DC differentiation. Therefore, we analyzed our progenitor culture for the presence of the recently described CDP (9, 10). Indeed, we found a Flt3+c-kitintM-CSFR+IL-7Rα− population, which also expressed the chemokine receptor CX3CR1 (Fig. 1A) (9–11). Thus, based on the surface marker expression and the differentiation potential of the cells (see below), we refer to this cell population as CDPs. Amplification of MPP and CDP populations from bone marrow. Bone marrow cells were cultured with Flt3L, SCF, hyper–IL-6, and IGF-1. A and B, In vitro-amplified bone marrow progenitors and in vivo lineage-negative bone marrow cells from CX3CR1gfp/+ mice (A, B, respectively) were stained for c-kit, Flt3, M-CSFR/CD115, and IL-7Rα/CD127 and analyzed by flow cytometry. In vitro cultures contained Flt3−/loc-kithi MPPs and Flt3+c-kitintM-CSFR+ CDPs, which showed the same surface marker profile as MPPs and CDPs from bone marrow. Data shown are representative of at least three independent experiments. C, PCA of in vivo CDPs and in vitro-generated MPPs, CDPs, cDCs, and pDCs. Each symbol represents a microarray data set: blue triangles, MPPs; orange squares, in vitro CDPs; green diamonds, in vivo CDPs; red dots, cDCs; purple triangles, pDCs. The two principal components PC1 and PC3 showed variances of 46.3 and 15.9%, respectively. In addition, the culture contained a population of Flt3−/loc-kithi cells (Fig. 1A). High c-kit expression correlates with immature stem/progenitor cell phenotype and Flt3−/loc-kithi cells were found to exhibit multilineage differentiation potential (see below), and we will hereafter refer to this cell population as MPPs. Finally, we compared the surface marker repertoire of in vitro-generated CDPs and MPPs with that of CDPs and MPPs isolated from bone marrow. In vitro-generated CDPs and MPPs were found to exhibit similar expression pattern as their in vivo counterparts (Fig. 1A, 1B). Next, CDPs and MPPs were subjected to genome-wide gene expression profiling. PCA demonstrated that in vivo CDPs and in vitro-amplified CDPs are very similar on the global gene expression level (Fig. 1C). To investigate the differentiation potential of the in vitro-generated MPPs and CDPs, cells were subjected to FACS sorting (Fig. 2A) and subsequently to colony formation assay. MPPs generated 80 ± 4 colonies per 5000 cells seeded (>40 cells/colony) (Fig. 2B). CFU granulocytes (CFU-Gs), CFU macrophages (CFU-Ms), CFU granulocyte/macrophage colonies (CFU-GMs), and a low number of mixed colonies with erythrocytes and megakaryocytes (CFU granulocyte, erythrocyte, macrophage, megakaryocyte [CFU-GEMM]) were found (Fig. 2B, Supplemental Fig. 3A). On the contrary, the number of colonies from CDPs was 10 times lower (on average, seven colonies comprising 10–20 cells per 5000 cells). All colonies generated from CDPs were CFU-M (Fig. 2B, Supplemental Fig. 3B). MPPs show multilineage differentiation potential and are upstream from CDP. In vitro-amplified MPP and CDP were FACS sorted at day 8 (A), and 5000 cells were seeded in semisolid methylcellulose containing insulin, transferrin, SCF, IL-3, IL-6, and erythropoietin (B). B, MPP-derived colonies consisting of >40 cells were scored for CFU-M, CFU-G, CFU-GM, and CFU-GEMM phenotype at day 6 (MPP). CDPs generated colonies of 10–20 cells in size, and colonies containing >10 cells were considered (CDP). The CFU-GEMM colonies rarely turned red and were phenotypically indistinguishable from mixed CFU-GM colonies (day 6), and therefore, the CFU-GM numbers shown comprise both CFU-GM and CFU-GEMM. C–E, Amplified MPPs and CDPs were FACS sorted as in A and cultured further under amplification conditions (Flt3L SCF, hyper–IL-6, and IGF-1). Cultures were analyzed at days 2, 5, and 8. C, MPP/CDP development was monitored by staining cells for c-kit and Flt3. D, Cumulative cell numbers were determined at regular time intervals and are depicted. E, Spontaneous DC differentiation was monitored by measuring CD11c expression. Representative data from two independent experiments are shown. The limited differentiation potential of CDPs in the colony formation assay indicated that CDPs are positioned downstream of MPPs. To investigate the population hierarchy, sorted MPPs and CDPs were cultured under amplification conditions (Flt3L, SCF, hyper–IL-6, and IGF-1) and analyzed by flow cytometry for the MPP/CDP markers at days 2, 5, and 8 postsorting. Interestingly, only MPPs were able to extensively proliferate and reproduce both MPPs and CDPs (Fig. 2C, 2D). CDPs showed a significantly lower proliferation capacity and even under growth conditions differentiated into CD11c+MHC-II+ DCs (Fig. 2C–E and data not shown). In summary, all of this suggests that CDPs are positioned downstream of MPPs and have a restricted differentiation potential. Next, we determined in more detail how MPPs and CDPs differ in their DC differentiation potential and kinetics. Amplified MPPs and CDPs were sorted and DC differentiation was induced by addition of Flt3L, M-CSF, or GM-CSF. Both MPPs and CDPs gave rise to pDCs and cDCs when cultured with Flt3L or M-CSF (Fig. 3A, 3B). In addition, under GM-CSF conditions, both progenitors gave rise to CD11c+MHC-II+ DCs (Fig. 3C). DC differentiation potential of sorted MPPs and CDPs. In vitro-amplified MPPs and CDPs were FACS sorted and cultured with Flt3L, M-CSF, or GM-CSF (5–8 d) to generate DC subsets and analyzed by FACS (A–C, respectively). A, CD11c+ cells were subdivided into pDCs and cDCs (CD11b−B220+ and CD11b+B220−, respectively) at day 8 of differentiation culture with Flt3L. B, pDCs (CD11b−SiglecH+, pregated on CD11c+ cells) obtained with M-CSF at day 5 of differentiation culture. SiglecH+ cells were also B220+ (data not shown). C, CD11c+MHC-IIhi DCs obtained with GM-CSF at day 5 of differentiation culture. D, Differentiation of MPPs and CDPs into CD11c+ cells in Flt3L M-CSF, or GM-CSF cultures was followed in time as indicated. E, Cell proliferation of MPPs and CDPs in Flt3L, GM-CSF, or M-CSF cultures was followed in time and is presented as fold change relative to the number of cells seeded. F and G, CD45.2+ MPPs and CDPs were obtained by in vitro culture and FACS sorted as Flt3−/loc-kithiCD11c− and Flt3+c-kitintM-CSFR+CD11c−IL-7Rα− cells, respectively. Sorted MPPs (F) and CDPs (G) were injected i.v. into lethally irradiated CD45.1+ recipients along with a radioprotective dose of CD45.1+ bone marrow. Recipient mice were sacrificed 10 d posttransplantation, and spleen was analyzed for DC subsets. Donor-derived pDCs were identified as CD45.2+CD11c+PDCA-1+CD11b− cells and cDCs as CD45.2+CD11c+PDCA-1−CD11b− (CD8α+ cDCs) and CD45.2+CD11c+PDCA-1−CD11b+ (CD11b+ cDCs); filled histogram, isotype control; open histogram, pDCs; open histogram with dashed line, CD11c+PDCA-1− cDCs. Three recipients per group were used. CDPs differentiated into CD11c+ DCs with considerably faster kinetics, reaching 70–90% CD11c+ cells already after 3 d in comparison with 10–30% in MPP cultures (Fig. 3D). Consistent with the fast differentiation kinetics, the proliferative capacity of CDPs was lower. CDPs showed a limited initial phase of proliferation within the first days of culture, and then cell numbers rapidly declined upon differentiation (Fig. 3E). In contrast, MPPs showed a higher proliferative potential in response to Flt3L and GM-CSF than CDPs and required a longer time to fully differentiate into DCs (Fig. 3D, 3E). We then proceeded to analyze the DC differentiation potential of MPPs and CDPs in vivo by transfer into lethally irradiated recipients. MPPs showed multilineage potential, as expected, and gave rise to CD11b+ cDCs, CD8α+ cDCs, and pDCs in spleen and bone marrow (Fig. 3F, Supplemental Figs. 4A, 5A, and data not shown). Importantly, also CDPs were able to differentiate into all DC subsets (Fig. 3G, Supplemental Fig. 4B). In spleen, CDPs preferentially gave rise to DCs, whereas in bone marrow CDP progeny was predominantly CD11c negative, comprising mainly CD19+ B cells (Fig. 3G, Supplemental Figs. 4B, 5B). This B cell potential was also observed in OP9 cocultures with IL-7 and Flt3L, in which both MPPs and CDPs were able to produce B220+CD19+ B cells (Supplemental Fig. 5C, 5D). CDPs were essentially devoid of myeloid, T, and NK cell potential in vivo (data not shown). Taken together, both MPPs and CDPs have the full potential to generate all DC subsets in vitro and in vivo. CDPs are considerably faster in DC differentiation and have a limited proliferation capacity, which is consistent with their position in differentiation hierarchy downstream of MPPs. To obtain further insight into the CDP differentiation potential, we performed genome-wide gene expression analysis of MPPs, CDPs, cDCs, and pDCs. A total of 775 genes were found to be differentially expressed by >2-fold between MPPs and CDPs, and these genes were subjected to hierarchical cluster analysis (Fig. 4A). Clusters I, II, and IV revealed a DC-like expression profile in CDPs, comprising genes that are already expressed in CDPs and further upregulated in cDCs and/or pDCs. Conversely, cluster VI contained MPP-associated genes, and these genes were not expressed (or expressed at low levels) in CDPs and DCs. Interestingly, CDPs clustered with cDCs and pDCs, indicating the close similarity between CDPs and DCs. CDPs exhibit a DC-primed gene expression profile. MPPs and CDPs were obtained by in vitro culture and FACS sorted as Flt3−/loc-kithiCD11c− and Flt3+c-kitintM-CSFR+CD11c−IL-7Rα− cells, respectively. cDCs and pDCs were generated from amplified progenitors with Flt3L and FACS sorted at differentiation day 6 as CD11c+CD11b+ and CD11c+CD11b−PDCA-1+B220+ cells, respectively. Total RNA was extracted and subjected to DNA microarray analysis (A) and semiquantitative RT-PCR analysis (B). A, Hierarchical cluster analysis of gene expression in MPPs, CDPs, cDCs, and pDCs. Gene expression data of 1019 probe sets (encoding for 775 genes) that were >2-fold differentially regulated between MPPs and CDPs are depicted in heatmap format. Each gene is represented by a single row of colored boxes. Blue, expression levels below median; white expression levels equal to median; red, expression levels above median. Cluster I: Pan-DC genes; cluster II: pDC genes; cluster IV: cDC genes; and cluster VI: MPP genes. B, RT-PCR analysis of representative genes found in cluster analysis (A) from sorted MPPs, CDPs, cDCs (upper panel) and pDCs (lower panel). C, Correlation matrix of MPPs, CDPs, pDCs, cDCs and in vivo CDPs is depicted in heatmap format. The Pearson correlation coefficients of sample pairs were calculated for the differentially expressed genes between MPPs and CDPs shown in A. Red, high correlation; blue, low correlation. C, negative control. Cluster I contains Pan-DC genes, such as Flt3 and Irf8 (Fig. 4A, 4B, Table I), that are important for cDC and pDC development (6, 37). Cluster I also includes the transcription factor Irf5 and the cytokine and chemokine receptors Il10ra and Ccr5. Further genes encode proteins involved in DC function, including cathepsin and caspase genes (Ctsh, Ctss, and Casp6), with cathepsin S (encoded by Ctss) being particularly important for MHC-II Ag presentation (53). Cluster II identifies pDC affiliated genes, such as Tlr7 and the transcription factor E2-2/Tcf4 (Fig. 4A, 4B, Table I) (41, 42), and both genes were upregulated from MPPs to CDPs. The pDC cluster also comprised lymphoid-related genes, including the surface markers Cd28 and Cd38 and the transcription factor Notch1, which is expressed in pDCs (54). Cluster IV comprises cDC-associated genes, including myeloid genes, like Id2, Tlr2, Fcgr1 (FcγR), and the chemokine receptor Cx3cr1 (Fig. 4A, 4B, Table I). Cluster IV also includes genes encoding proteins involved in Ag processing and presentation, such as Lgmn and Ctsc (55). Cluster V identifies CDP-specific genes, which include Csf1r (M-CSFR) and Id3 (Fig. 4A, 4B, Table I). M-CSFR is one surface marker used to characterize CDPs, and M-CSFR expression indeed peaks in CDPs. Id3, similar to Id2, contributes to the restricted developmental potential of CDPs (38, 56). Cluster VI comprises hematopoietic stem/progenitor cell genes highly expressed in MPPs and downregulated in CDPs and DCs. These include several transcription factors related to cell proliferation and self-renewal, like Gata2, Cebpa, Nfe2, Tal1, and Gfi1 (Fig. 4A, 4B, Table I) (57–59). Additionally, a number of stem/progenitor cell-related surface proteins, including Ncam1, Trfr2, Prom1, Itga6 (CD49f), and Cd34, are found in this cluster (57–59). Interestingly, the SCF receptor c-kit, used to characterize MPPs by flow cytometry (Figs. 1, 2A), is found in a separate cluster of genes with prominent expression in MPPs and cDCs (Cluster VII, Fig. 4A, 4B, Table I). High c-kit expression on cDCs is consistent with FACS data and previous reports (K. Seré and M. Zenke, unpublished observations) (60). Then, MPPs, CDPs, cDCs, and pDCs, including in vivo CDPs from bone marrow, were subjected to correlation matrix analysis using the differentially expressed genes as in Fig. 4A. We demonstrate that in vitro-amplified CDPs and in vivo CDPs cluster together and exhibit a high correlation in their gene expression profile (Fig. 4C). Taken together, genes important for DC differentiation are upregulated from MPPs to CDPs, and their expression is further enhanced in DCs. Concomitantly, expression of proliferation/multipotency-associated genes declines upon CDP and DC differentiation. Importantly, CDPs express both cDC- and pDC-specific genes, consistent with their capacity to differentiate into both DC subsets. Thus, this gene expression analysis provides further support for the DC-primed character of CDPs. TGF-β1 signaling is of pivotal importance for DC development (25, 38, 61–63), yet the impact of TGF-β1 signaling on DC subset specification from CDPs has not been analyzed. The in vitro system described in this paper provides an excellent means to decipher molecular events in response to TGF-β1 in CDPs and its consequences. Therefore, CDPs were obtained by in vitro culture, FACS sorted, and treated with TGF-β1 for 4, 8, 12, and 24 h for genome-wide gene expression analysis. A total of 3758 genes were regulated >2-fold by TGF-β1 and further subjected to clustering. 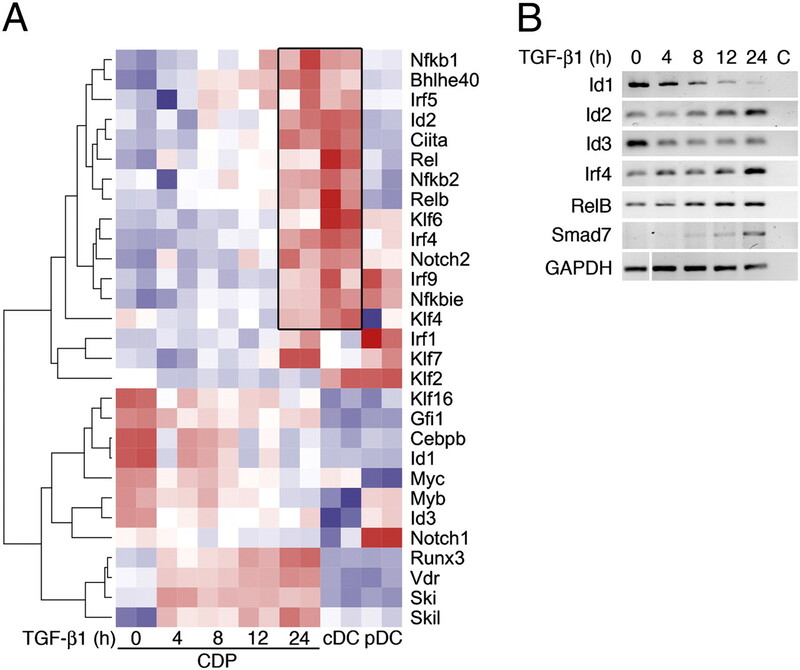 The analysis revealed clusters of up- and downregulated genes that contained known TGF-β1 target genes, such as Smad7, Id2, and Irf4 (Supplemental Fig. 6) (24, 38, 62). PCA analysis positioned TGF-β1–treated CDPs between untreated CDPs and DCs, indicating that TGF-β1 promotes DC differentiation (Fig. 5A). To further extend this observation, we generated DCs in the presence and absence of TGF-β1 and analyzed DC development by flow cytometry. Strikingly, TGF-β1 compromised pDC development, whereas cDC differentiation remained unaffected (Fig. 5B). TGF-β1 inhibits B cell development by inducing apoptosis in B cell progenitors (56). Similarly, TGF-β1 induced apoptosis in CDPs cultured with Flt3L (Fig. 5C, 5D). TGF-β1 accelerates DC differentiation and directs subset specification toward cDCs. A, PCA of TGF-β1–treated (24 h) and untreated (0 h) CDPs and of cDCs and pDCs based on the expression of genes differentially regulated >2-fold by TGF-β1 (3758 genes). The two principal components PC1 and PC3 showed variances of 45.1 and 18.4%, respectively. B, Bone marrow progenitors were amplified with Flt3L, SCF, hyper–IL-6, and IGF-1 for 7 d. DC differentiation was induced with Flt3L in the presence or absence of TGF-β1 (3 ng/ml). Cultures were analyzed for pDC (CD11c+CD11b−B220+) and cDC (CD11c+CD11b+B220−) subsets at day 10 of differentiation. Representative data from at least three independent experiments are shown. C and D, MPPs and CDPs were obtained by FACS sorting at day 7 as in Fig. 2A, and DC differentiation was induced with Flt3L. Sixteen hours later, cultures were treated with TGF-β1 (3 ng/ml) for 48 h. Apoptosis was analyzed with Annexin V and propidium iodide (PI) staining and viable cells (PI-) and apoptotic cells (Annexin V+ PI-) are depicted (C, D, respectively). Error bars represent SD from mean (n = 4). Data shown are from two independent experiments. To gain further insight into the molecular mechanism of TGF-β1 impact on DC differentiation, TGF-β1–regulated genes were subjected to GO (http://www.geneontology.org) overrepresentation analysis. Interestingly, TGF-β1–induced genes were found in GO categories related to immune cell activation and differentiation, Ag presentation, and signal transduction (Supplemental Table II). On the contrary, TGF-β1–downregulated genes were involved in nucleic acid and amino acid metabolism and cell cycle control (Supplemental Table II), which relates to the growth inhibition and DC differentiation promoting activity of TGF-β1. Given the instructive role of transcription factors and cytokine-driven signaling in DC differentiation, we further focused on transcription factors and surface molecules regulated by TGF-β1. TGF-β1 induced Pan-DC genes, such as Flt3, CD11c/Itgax, and Il10ra (Tables I, II). Moreover, TGF-β1 induced a cDC-like transcription profile in CDPs by upregulating the expression of Id2, members of the NF-κB signaling pathway (Nfkb1, Nfkb2, Nfkbie, relB, and Rel), MHC-II molecules, such as H2-DMa, H2-DMb2 and CD74 (MHC-II invariant chain), and costimulatory molecules, including Cd40 and Cd80 (Table II). The induction of a cDC-like transcription profile in TGF-β1–treated CDPs was also observed by hierarchical cluster analysis (Fig. 6A). Interestingly, expression of pDC-affiliated genes, such as Cd28, Cd38, Tlr7, and Notch1, was downregulated by TGF-β1 similar to the MPP-related genes Myb, Myc, and Gfi1 (Tables I, II). These results were further supported by RT-PCR analysis (Fig. 6B). Transcription factors involved in TGF-β1 signaling and DC development. A, Hierarchical clustering and heatmap representation of transcription factors involved in TGF-β1 signaling and DC development obtained from gene array data (GEO accession number GSE22432). Genes that are highly induced upon TGF-β1 treatment after 24 h and abundantly expressed in cDCs are indicated (box). B, RT-PCR analysis of selected genes shown in A. Taken together, our results suggest that TGF-β1 accelerates DC differentiation and subset specification of CDPs through upregulation of a specific set of transcription factors. As a consequence, CDPs acquire a cDC-like molecular signature that instructs cDC differentiation and inhibits pDC development. An increasingly precise picture of DC development is emerging, including the identification of DC-restricted Flt3+c-kitintM-CSFR+ CDPs (9, 10). In this study, we investigated CDPs amplified to high cell numbers from bone marrow and show that they recapitulate the cell surface marker profile, function, and gene expression of the in vivo CDPs. A detailed molecular analysis demonstrates that CDPs exhibit a DC-primed gene transcription profile. Additionally, the in vitro system allowed investigation of 1) the consecutive development of MPPs into CDPs and their further differentiation into DC subsets and 2) the impact of TGF-β1 on CDP differentiation. We show that TGF-β1 directs differentiation toward cDCs at the expense of pDC development by inducing a cDC-affiliated transcription profile. Thus, the in vitro expansion of the DC committed CDP and its manipulation by TGF-β1 might allow the development of new vaccine strategies. Cell commitment and differentiation are regulated by extrinsic clues, cytokines and growth factors, and intrinsic transcriptional regulators. During development of specific hematopoietic lineages, the gene expression repertoire and the options of stem/progenitor cells become increasingly restricted, leading to the establishment of a specific lineage from the choice of several. This involves the activation of lineage-affiliated genes and repression of unrelated genes. Accordingly, during development from MPPs, our in vitro-generated CDPs upregulate receptors for all known DC-poietins Flt3L, GM-CSF, and M-CSF and readily differentiate into all DC subsets in response to cognate ligands in vitro. In vivo, these CDPs generate all lymphoid tissue DC subsets posttransplantation. Gene expression profiling revealed that DC-specific transcription profiles are activated from MPPs to CDPs and further to the DC subsets. Consistent with their capacity to generate both cDCs and pDCs, CDPs express Pan-DC genes as well as genes specific for either DC subset. Interestingly, genes important for DC function, such as pattern recognition (Tlr2 and Tlr7), Ag processing (cathepsin S) (53), and MHC-II presentation (legumain) (55), were already upregulated from MPPs to CDPs. Thus, CDPs harbor the molecular machinery that upon proper stimuli enables full DC differentiation and DC subset specification. Concomitantly with lineage specification, hematopoietic cells cease proliferating and undergo cell cycle arrest. In line with the loss of self-renewal capacity and multilineage potential, CDP differentiation from MPPs is accompanied by downregulation of stem/progenitor cell-associated gene expression. Thus, in parallel to acquiring a DC-primed receptor and transcription factor repertoire, CDPs downregulate receptors and transcription factors important for stem cell proliferation and self-renewal, such as c-kit and Gata2. The crucial role of TGF-β1 in Langerhans cell development is well established (25–27), whereas the effect of TGF-β1 on the development of other DC subsets remained elusive. Interestingly, TGF-β1 has most recently been implicated in regulating hematopoietic stem cells (HSCs), having a selective impact on myeloid-biased HSCs at the expense of lymphoid-biased HSCs (64). Thus, we employed our in vitro system to study the impact of TGF-β1 on CDP differentiation and subset specification. We found that: 1) TGF-β1 pushed the CDP transcription profile toward DCs within 24 h, indicating that TGF-β1 accelerates DC differentiation from CDPs; 2) TGF-β1–treated CDPs acquired a cDC-affiliated transcription factor repertoire, with the induction of cDC differentiation instructing transcriptional regulators, including IRF-4 and several members of the NF-kB family (37, 39, 40); and 3) TGF-β1 induced transcription factors that inhibit pDC differentiation, such as Id2 and IRF-1 (38, 65). The results reported in this study are very much in line with the observation that ectopic Id2 expression compromises pDC development (66) and that Id2-deficient mice have increased pDC frequencies (38). Id2 is an HLH factor that lacks the adjacent basic region required for DNA binding and thereby antagonizes activating HLH factors, like E2-2/Tcf4 and E2A, in a DNA-independent manner (67). E2-2/Tcf4 is an HLH factor essential for pDC development, as demonstrated by gene knockout and knockdown studies (41, 42). Conversely, overexpression of HLH factors, such as HEB and E2A, were reported to promote pDC development (43). Bhlhe40/Stra13/Dec1 represents another HLH factor that is induced in CDPs by TGF-β1. Bhlhe40/Stra13 acts as transcriptional repressor while binding to E-box DNA elements and thus antagonizes other HLH factors in a DNA-dependent manner (68). Thus, it is tempting to speculate that Bhlhe40/Stra13 might be yet another transcription factor that represses pDC development. Interestingly, 24 h TGF-β1 treatment was sufficient to induce also genes related to DC function, such as costimulatory molecules, MHC-II genes, and genes involved in Ag processing and presentation (Cd40, Cd80, H2-DMa, CD74, and Ctss). In summary, our studies uncover the DC-primed expression repertoire of CDPs, which is very much in line with CDP function as a lineage-committed progenitor cell. CDP is still bipotential, and we identify TGF-β1 as a determining factor that acts on the bifurcation point of cDC versus pDC development and directs cDC subset specification. We thank M. Okabe, S. Jung, F. Tacke, S. Rose-John, M. Busslinger, and U. Just for providing mice and reagents. We also thank F. Tacke and F. Heymann for cell sorting, J. Ober-Bloebaum for help with bone marrow transplantation experiments, S. Mitzka for excellent technical assistance, and A. Offergeld for expert secretary assistance. This work was supported by Grants SFB542 and SPP1356 from the German Research Foundation (to M.Z.). The microarray data presented in this article have been submitted to the Gene Expression Omnibus database (http://www.ncbi.nlm.nih.gov/geo) under accession number GSE22432.
. 2009. Dendritic cell homeostasis. Blood 113: 3418–3427.
. 2001. Dendritic cell potentials of early lymphoid and myeloid progenitors. Blood 97: 3333–3341.
. 2003. The early progenitors of mouse dendritic cells and plasmacytoid predendritic cells are within the bone marrow hemopoietic precursors expressing Flt3. J. Exp. Med. 198: 293–303.
. 2006. Activation of the Flt3 signal transduction cascade rescues and enhances type I interferon-producing and dendritic cell development. J. Exp. Med. 203: 227–238.
. 2008. 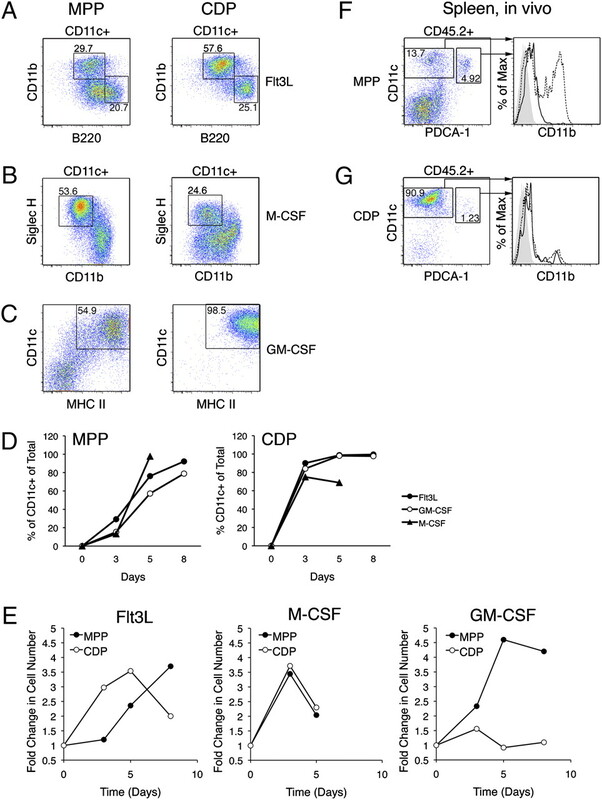 M-CSF: a novel plasmacytoid and conventional dendritic cell poietin. Blood 111: 150–159.
. 2000. Flt3-ligand and granulocyte colony-stimulating factor mobilize distinct human dendritic cell subsets in vivo. J. Immunol. 165: 566–572.
. 2000. Mice lacking flt3 ligand have deficient hematopoiesis affecting hematopoietic progenitor cells, dendritic cells, and natural killer cells. Blood 95: 3489–3497.
. 2005. The colony-stimulating factor 1 receptor is expressed on dendritic cells during differentiation and regulates their expansion. J. Immunol. 175: 1399–1405.
. 1997. The influence of granulocyte/macrophage colony-stimulating factor on dendritic cell levels in mouse lymphoid organs. Eur. J. Immunol. 27: 40–44.
. 2005. The role of Smad signaling in hematopoiesis. Oncogene 24: 5676–5692.
. 1996. A role for endogenous transforming growth factor beta 1 in Langerhans cell biology: the skin of transforming growth factor beta 1 null mice is devoid of epidermal Langerhans cells. J. Exp. Med. 184: 2417–2422.
. 1996. 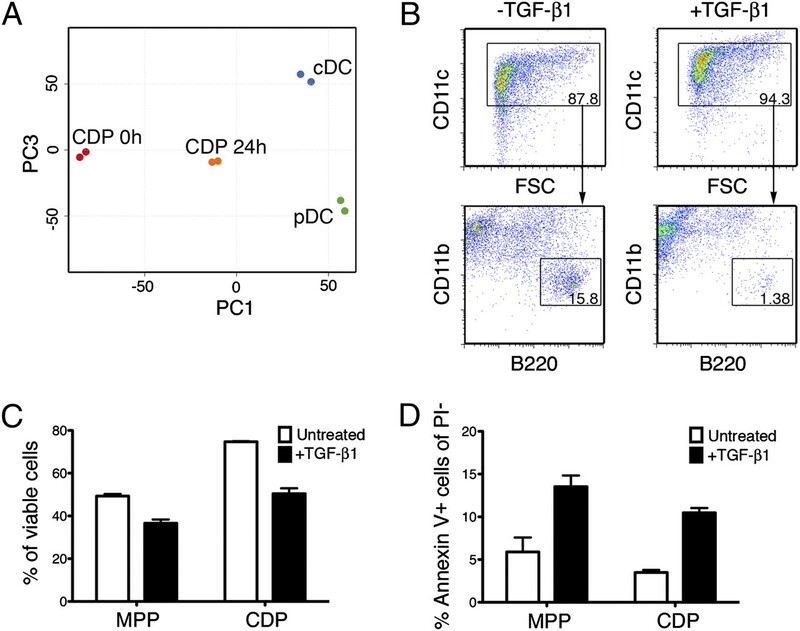 TGF-beta 1 promotes in vitro development of dendritic cells from CD34+ hemopoietic progenitors. J. Immunol. 157: 1499–1507.
. 1997. flt3 ligand in cooperation with transforming growth factor-beta1 potentiates in vitro development of Langerhans-type dendritic cells and allows single-cell dendritic cell cluster formation under serum-free conditions. Blood 90: 1425–1434.
. 2006. Towards an understanding of the transcription factor network of dendritic cell development. Trends Immunol. 27: 140–145.
. 2003. STAT3 is required for Flt3L-dependent dendritic cell differentiation. Immunity 19: 903–912.
. 2010. The transcription factor PU.1 controls dendritic cell development and Flt3 cytokine receptor expression in a dose-dependent manner. Immunity 32: 628–641.
. 2000. PU.1 is required for myeloid-derived but not lymphoid-derived dendritic cells. Blood 95: 879–885.
. 2000. Transcription factor PU.1 is necessary for development of thymic and myeloid progenitor-derived dendritic cells. J. Immunol. 164: 1855–1861.
. 1994. The Ikaros gene is required for the development of all lymphoid lineages. Cell 79: 143–156.
. 2006. Ikaros is required for plasmacytoid dendritic cell differentiation. Blood 108: 4025–4034.
. 1997. Cell-autonomous defects in dendritic cell populations of Ikaros mutant mice point to a developmental relationship with the lymphoid lineage. Immunity 7: 483–492.
. 2007. The role of the interferon regulatory factor (IRF) family in dendritic cell development and function. Cytokine Growth Factor Rev. 18: 503–510.
. 2003. Transcriptional profiling identifies Id2 function in dendritic cell development. Nat. Immunol. 4: 380–386.
. 1995. Expression of relB is required for the development of thymic medulla and dendritic cells. Nature 373: 531–536.
. 1998. RelB is essential for the development of myeloid-related CD8alpha- dendritic cells but not of lymphoid-related CD8alpha+ dendritic cells. Immunity 9: 839–847.
. 2008. Transcription factor E2-2 is an essential and specific regulator of plasmacytoid dendritic cell development. Cell 135: 37–48.
. 2008. 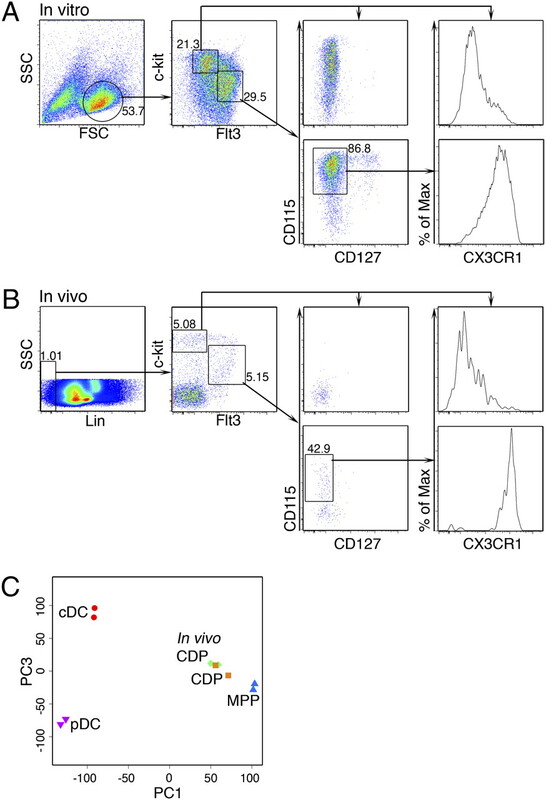 Development of human plasmacytoid dendritic cells depends on the combined action of the basic helix-loop-helix factor E2-2 and the Ets factor Spi-B. Eur. J. Immunol. 38: 2389–2400.
. 2004. The ETS transcription factor Spi-B is required for human plasmacytoid dendritic cell development. J. Exp. Med. 200: 1503–1509.
. 1997. ‘Green mice’ as a source of ubiquitous green cells. FEBS Lett. 407: 313–319.
. 2000. Analysis of fractalkine receptor CX(3)CR1 function by targeted deletion and green fluorescent protein reporter gene insertion. Mol. Cell. Biol. 20: 4106–4114.
. 2005. Progressive and controlled development of mouse dendritic cells from Flt3+CD11b+ progenitors in vitro. J. Immunol. 174: 2552–2562.
. 1995. Controlling the false discovery rate: A practical and powerful approach to multiple testing. J. R. Stat. Soc. B. 57: 289–300.
. 2007. Mfuzz: a software package for soft clustering of microarray data. Bioinformation 2: 5–7. 1987. Silhouettes: a graphical aid to the interpretation and validation of cluster analysis. J. Comput. Appl. Math. 20: 53–65.
. 2006. Improved scoring of functional groups from gene expression data by decorrelating GO graph structure. Bioinformatics 22: 1600–1607.
. 2000. Gene ontology: tool for the unification of biology. Nat. Genet. 25: 25–29.
. 1999. Impaired invariant chain degradation and antigen presentation and diminished collagen-induced arthritis in cathepsin S null mice. Immunity 10: 207–217.
. 2005. Derivation of 2 categories of plasmacytoid dendritic cells in murine bone marrow. Blood 105: 4407–4415.
. 1998. An asparaginyl endopeptidase processes a microbial antigen for class II MHC presentation. Nature 396: 695–699.
. 2001. Id3 inhibits B lymphocyte progenitor growth and survival in response to TGF-beta. Nat. Immunol. 2: 242–247.
. 2002. A stem cell molecular signature. Science 298: 601–604.
. 2002. “Stemness”: transcriptional profiling of embryonic and adult stem cells. Science 298: 597–600.
. 2007. Molecular evidence for hierarchical transcriptional lineage priming in fetal and adult stem cells and multipotent progenitors. Immunity 26: 407–419.
. 2008. Activation of c-Kit in dendritic cells regulates T helper cell differentiation and allergic asthma. Nat. Med. 14: 565–573.
. 2004. Runx3 regulates mouse TGF-beta-mediated dendritic cell function and its absence results in airway inflammation. EMBO J. 23: 969–979.
. 2007. Transforming growth factor beta1 up-regulates interferon regulatory factor 8 during dendritic cell development. Eur. J. Immunol. 37: 1174–1183.
. 2006. Differential involvement of PU.1 and Id2 downstream of TGF-beta1 during Langerhans-cell commitment. Blood 107: 1445–1453.
. 2010. Distinct hematopoietic stem cell subtypes are differentially regulated by TGF-beta1. Cell Stem Cell 6: 265–278.
. 2006. IRF-1 deficiency skews the differentiation of dendritic cells toward plasmacytoid and tolerogenic features. J. Leukoc. Biol. 80: 1500–1511.
. 2000. Id2 and Id3 inhibit development of CD34(+) stem cells into predendritic cell (pre-DC)2 but not into pre-DC1. Evidence for a lymphoid origin of pre-DC2. J. Exp. Med. 192: 1775–1784. 2009. E and ID proteins branch out. Nat. Rev. Immunol. 9: 175–184.
. 2002. Stra13 homodimers repress transcription through class B E-box elements. J. Biol. Chem. 277: 46544–46551.